Let's take a look at art displayed on public property. 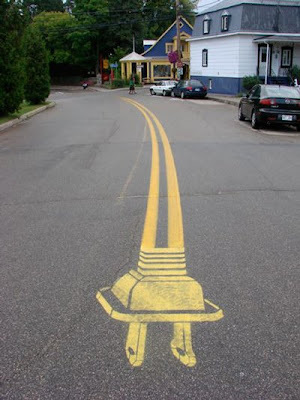 Artist Peter Gibson ( Roadsworth,) painted these pictures on the streets of Montreal in the darkness of night. He started in 2001 and remained anonymous for almost 3 years. 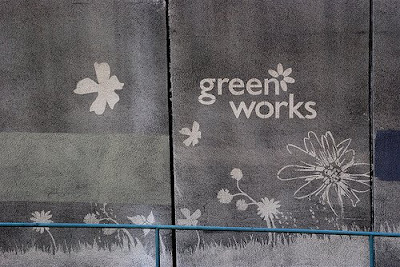 In the beginning, he painting bicycles and bicycle symbols to show his discontent with the cities bicycle path system , but soon it grew into stenciling different and more complex designs. He would stencil zippers, power switches, etc. He attributed 9/11 as the catalyst that made him feel he had nothing to loose by painting on public property. Many questioned whether the (anonymous at the time) painter was destroying public property, using it to make a political point, or just an artist trying to use the scenery in self expression. 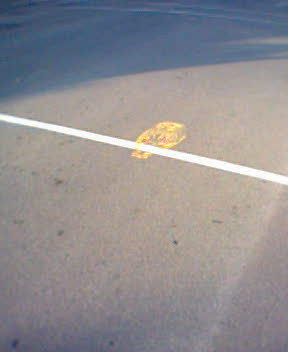 Roadsworth admits that the stenciling turned into an art project over time. 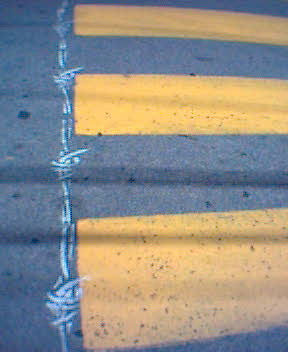 In 2004 the authorities finally caught Roadsworth in the act of painting a Christmas ribbon at an intersection and took him into custody. He was facing over 200 thousand dollars in fines, criminal court, and serious jail time. The court was lenient and only charged him a $250.00 fine with 40 hours of community service. There was a large amount of public support for the artist and he was very lucky not to have a criminal record from his street art. He had been charged with 53 counts of mischief, but the large amount of public support swayed the court. After his run in with the authorities, Roadsworth has been continuing his artistic flare and is trying to make a name for himself as an artist….legally of course. 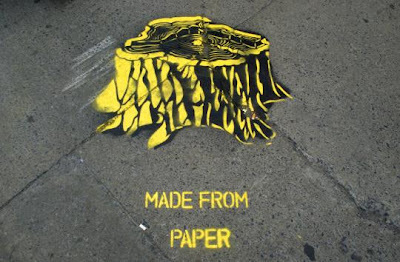 He has since received many invitations to create art on the sidewalks of businesses and has even got several commission and permits from city hall to create street art (as part of his community service.) That seemed rather odd to me that he was given a commission to do street art as public service time for creating street art? 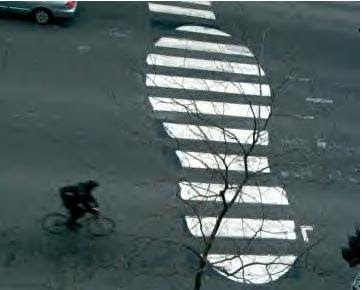 What I take away from his road and sidewalk art is the exploration between what is art and what is graffiti? This seems to be a very interesting question for many people. You can see a documentary here that follows Roadsworth. He has added stenciling in words to some of his commissions. 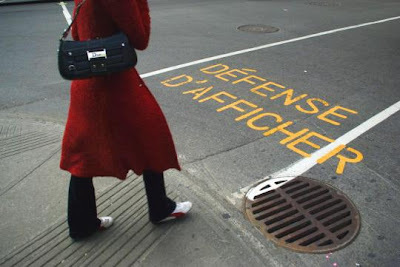 One of his commissions featured the words"Défense d'Afficher", which means "No Postering". So he has not lost his desire to question who owns public space. At least, that is my interpretation. Paul Curtis “Moose“, a British artist, scrubs dirty or dilapidated city properties like -tunnels or sidewalks. Words and images are formed by cleaning some parts and leaving some parts dirty. The artist calls it “refacing,” but many call it defacing. Most of the messages created are his own, but sometimes he takes contributions to display someone else's message. Authorities and city officials have been searching for a way to prosecute, but what are they going to do charge him with illegally cleaning? The above picture is one of his “refacing” art pieces. 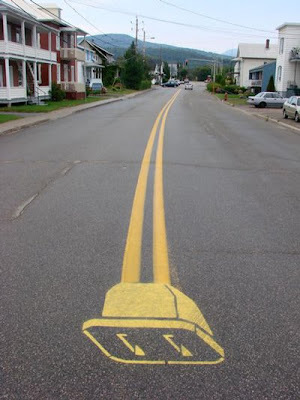 It seems that some cities (including some here in the US) have looked at the effect of Roadsworth's art from a positive perspective . 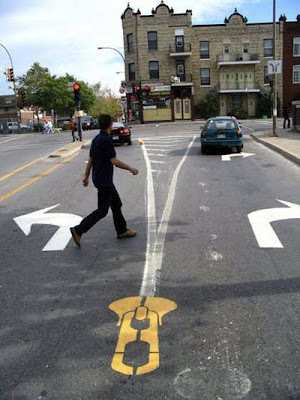 For example: In Cambridge, Massachusetts the city paid local artist Wen-ti Tsen $10,000 to paint an abstract design to tackle the problem of speeding cars. 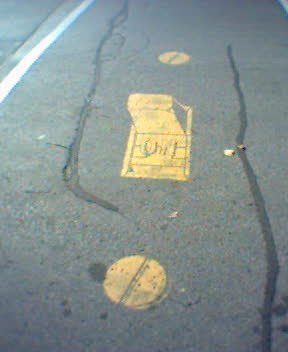 Wen-ti painted a mural that looked like a traffic circle in the middle of a busy intersection. When you approach it, you inevitably slow down because it appears that there is a hole in the road. Then you drive over it and realize that it is flat. Although, in June of this year, the city announced plans to redo the intersection because they claim the painting did not slow traffic down. I will leave you with a few more Roadsworth pictures and you decide if this is art , destroying public property, free speech, or graffiti. What do you call it? 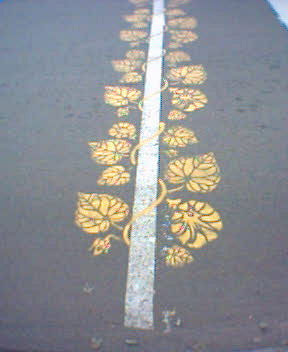 This is one of the Roadsworth commissioned works. I think that the art work is beautiful and sure adds a different look to the everyday road way that I am sure many people travel on daily basis. I know personally seeing the same lines on the road gets really boring, and if this gentleman isn't hurting anyone then it should be considered art and not graffiti!! Grafitti is some stupid slander or gang posting on the side of a builing or wall not something beautiful that should not offend anyone!! good job, they are absolutely wonderful to look at!!! you should come to alberta, lol..
this guy looks like he's seen a couple Banksy stencils in his life.